Voting Results (Top 4): Welke-196|7 (11%), Reynolds-055 (10%), West-S2 (8%), O'Nora-184 (5%). Bill Welke & Jim Reynolds were the two umpires for the UEFL's 2015 Ejections of the Year. In Ejection 196-197: Bill Welke (3-4; Votto, Price), HP Umpire Bill Welke ejected Reds 1B Joey Votto and subsequently Manager Bryan Price for arguing a strike two call in the bottom of the 8th inning of the September 9 Pirates-Reds game. 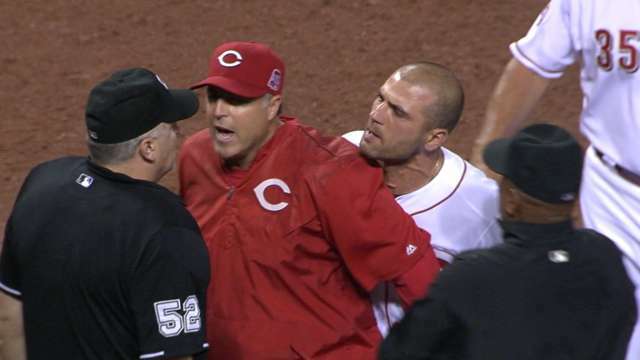 For the second time during a 2015 ejection, Votto initiated unsporting contact with the ejecting umpire and the league ultimately suspended Votto for his actions. In Ejection 055: Jim Reynolds (1; Bryan Price), acting crew chief Jim Reynolds ejected Price during pregame festivities for arguing calls from the previous game, presumably then-HP Umpire Manny Gonzalez's strike zone. 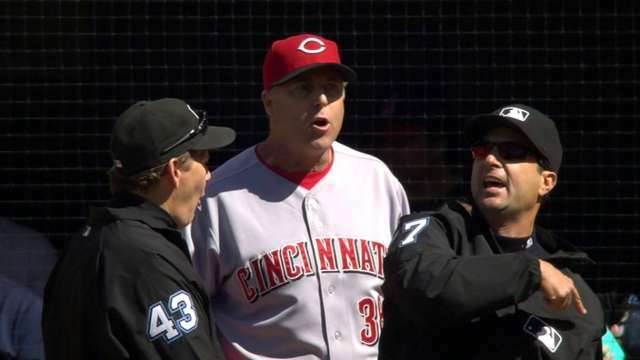 One observer summed up the totality of the ejection sequence thusly: "Bryan Price really did not accomplish much of anything in this ejection and Reynolds handled it like a pro, sticking up for a crew member of his who was being disrespected by Price. Very entertaining." Bill Welke now has 7 points in the UEFL Standings (6 Previous + 1 Award = 7). Jim Reynolds now has 5 points in the UEFL Standings (4 Previous + 1 Award = 5).